I feel like all I do is plan to post things here, tell you my plan, then I don't follow through. Then I come back here to apologia before sharing yet another plan. It's a vicious cycle. Anywho, my most recent disappearance from both here and youtube is from me having to find a new apartment on super short notice. I've been living in an apartment in a family's reno'd basement since June when I moved across the country. The plan was always to have a lease until the end of Aug. with the ability to extend the lease at that time if I chose to stay. My landlady sends me a message at the beginning of August asking me to let her know that week whether I was wanting to stay or not as she would love me to be understands if I want a bigger place. A day or two later I let her know I'd love to stay and she emails me back the next day informing me she isn't renting out the apartment to anyone and that I have until the 2nd of Sept to get out. Gee thanks lady! So since then I've been apartment hunting. Super stressful! Anywho, I believe I now have a new place to live come Sept, so I can start getting back to my regular routines and that means back to reading. So why not participate in a read-a-thon? No reason at all (well other than packing like crazy, but whatevs). 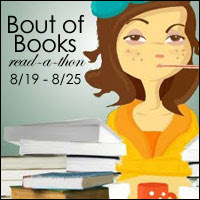 I just found out today that the Bout of Books read-a-thon is coming back next week! From August 19-25 and I will give it my best show to participate. But what is the Bout of Books read-a-thon, you ask?